There’s no place like Kentucky State University, the campus on the Hill. Homecoming 2018 will be more than just a celebration. It is a week of excitement uniting students and organizations, Frankfort and the Kentucky State family, showcasing our Thorobred pride and spirit. Events officially kick off Sunday, Oct. 7 at noon on Jones Field with the powder puff football game. Admission is free. The Homecoming gospel concert is scheduled for 5 p.m. in the Carl H. Smith Auditorium in David H. Bradford Hall. Doors open at 4 p.m. General admission ticket prices are TBD. Admission is free for all Kentucky State students. Get a sneak peek of the latest fashion trends for 2018 Monday, Oct. 8 at 9 p.m. in Carl H. Smith Auditorium in David H. Bradford Hall with the Homecoming Fashion Show. Admission is $10 and free to Kentucky State students. The Student Government Association Masquerade Ball takes place in the Carl M. Hill Student Center Ballroom Tuesday, Oct. 9 at 9 p.m. Admission is free to all Kentucky State students. Wednesday, Oct. 10 has a little something for everyone. The block party begins in the Carl M. Hill Student Center Courtyard Wednesday, Oct. 10 at 11 a.m. Claim your seat early for the pep rally at 7 p.m. in the outdoor amphitheater. Are you ready to laugh the night away? The comedy show begins in the Carl H. Smith Auditorium in David H. Bradford Hall at 9 p.m. following the pep rally. General admission is $10. Kentucky State students get in free. Pre-registration package pick-up for alumni is from 3 p.m. until 7 p.m. at the Alumni House Thursday, Oct. 11. The Student Government Association inauguration takes place at 11 a.m. in the Carl H. Smith Auditorium of David H. Bradford Hall. Chicago alumni will meet with students from 5 p.m. until 6:30 p.m. at the Alumni House. For an evening in Paris, join us in the William Exum Center at 7:30 p.m. for the Mister and Miss Kentucky State University Coronation and Royal Reception. A meet-and-greet for alumni is from 8 a.m. until 9:45 a.m. Friday in the Alumni House. Registration and ticket payment is from 8:30 a.m. until noon and 1 p.m. until 5 p.m. at the Alumni House. Package pick-up for alumni is at the Capital Plaza Hotel glass room from 8:30 a.m. until noon and 1 p.m. until 5 p.m. The We Are Champions breakfast is from 8:30 a.m. until 9:30 a.m. in the William Exum Center. The Kings and Queens breakfast, for all former Mr. and Miss Kentucky State, is also from 8:30 a.m. until 9:30 a.m., with the location to be announced (TBA). Kings and queens must RSVP for the breakfast. Contact Ray Bankston at (502) 597-6688 or via email at ray.bankston@kysu.edu for more information. The K-Club golf tournament will take place from 9 a.m. until noon at Duckers Lake Golf Course. The cost is $85. Founder’s Day is scheduled for 10 a.m. until noon in the Carl M. Smith Auditorium in David H. Bradford Hall. The golden class of 1968 will be honored during Founder’s Day. Golden graduates are encouraged to contact Patricia Russell McCloud at (404) 754-3602 or via email at prmlink@aol.com for more details on participation. Following Founder’s Day, the class of 1968 will be honored with a reception. Vendors will flood the Student Center courtyard Friday, Oct. 12 for the annual Street Fest, starting at 11 a.m.. A luncheon is also scheduled for noon in the Underwood Cafeteria. A Kappa Alpha Psi foundation meeting is from noon until 5 p.m. at the Academic Services Building welcome center. The executive board of the Kentucky State University National Alumni Association general assembly meeting will take place from 2 p.m. until 4 p.m. in the Student Center ballroom. The Thorobred Run Day party is scheduled for alumni from 3 p.m. until 8 p.m. at the Glenn Willis House. Admission is $50. Kentucky State University History Happy Hour is scheduled from 5 p.m. until 7 p.m. at Buffalo Trace Distillery. Admission is free but reservations are required. Click here to register. The K-Club Hall of Fame banquet is from 6 p.m. until 9:30 p.m. in the Student Center ballroom. Admission is $25. The classes-in-reunion cocktail reception will occur from 6 p.m. until 7 p.m. in the Capital Plaza ballroom hallway. Admission is $60. The classes-in-reunion gala begins at 7:15 p.m. and lasts until 9:30 p.m. in the Capital Plaza ballroom. Admission is $60. Classes-in-reunion include the classes of 1958, 1963, 1968, 1973, 1978, 1983, 1988, 1993, 2003 and 2008 alumni. Greek organizations will steal the show at 8 p.m. in the William Exum Center during the annual step show. Advanced tickets are $15. Tickets are $20 at the door. Kentucky State student admission is $15. Doors open at 7 p.m. The Club 1886 party with live music from Toy Factory begins at 10 p.m. and lasts until 2 a.m. in the Capital Plaza ballroom. Admission is $35. The young alumni party is from 10 p.m. until 2 a.m. at the Capital Plaza. Admission is $20. Stop by the Ham & Jam breakfast Saturday, Oct. 13 beginning at 9 a.m. in downtown Frankfort. The annual Homecoming community parade begins at 10 a.m. The alumni breakfast begins at 11 a.m. at Hillcrest Manor. Tailgating begins Saturday at 6:30 a.m. at Alumni Stadium. 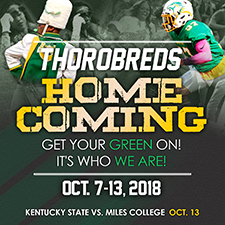 The Homecoming football game between Kentucky State and Miles College kicks off at 2 p.m. at Alumni Stadium. Arrive early to enjoy the atmosphere. The Homecoming concert featuring Young Dolph, K-Camp and Dreezy at the William Exum Center starts at 8 p.m. Doors open at 7 p.m. General admission ticket prices are $30 in advance and $40 at the door. The concert is free to all Kentucky State students. The Kentucky State Ta’kanda Forever African-themed party and concert for alumni is scheduled from 9 p.m. until 3 a.m. at the Capital Plaza. General admission is $25. VIP admission is $40. The Welcome to Kentucky State Ta’kanda Young Sir party for alumni is scheduled from 10 p.m. until 3 a.m. at the Capital Plaza. Admission is $20. The Jam Sessions Lounge will take place from 10 p.m. until 3 a.m. at the Capital Plaza. Admission is $10. Campus clean-up will begin Sunday, Oct. 14 at 10 a.m.